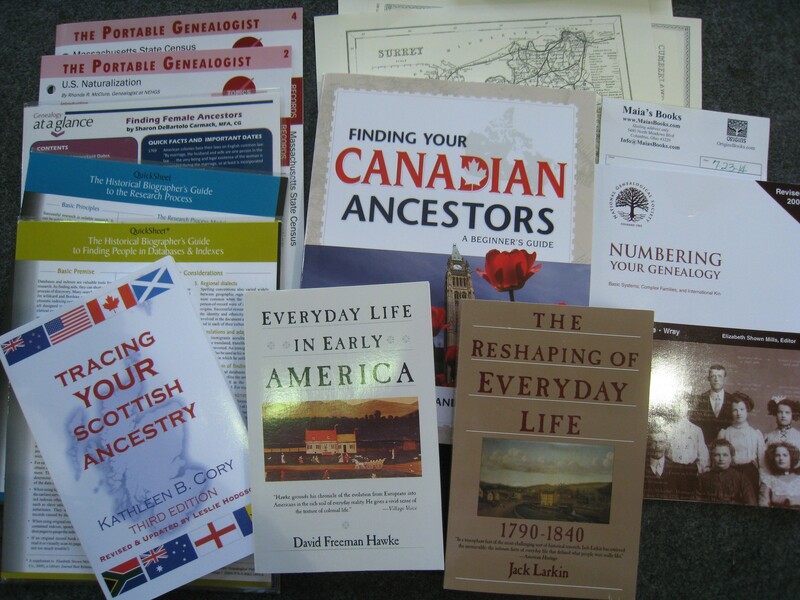 This week I attended GRIP, the Genealogical Research Institute of Pittsburgh. I registered in late winter and managed to get into the “Law School for Genealogists” class led by Judy G. Russell, J.D., CG, CGL and Richard “Rick” G. Sayre, CG, CGL. The institute was held at LaRoche College, and I stayed, along with many other attendees, in the dorms, and ate meals in the cafeteria. 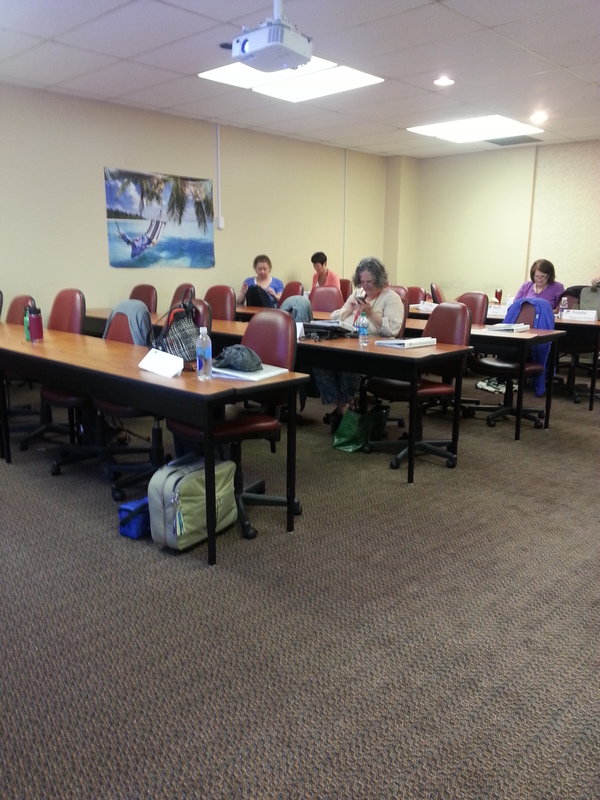 Others took classes on genetic genealogy and a variety of other topics. 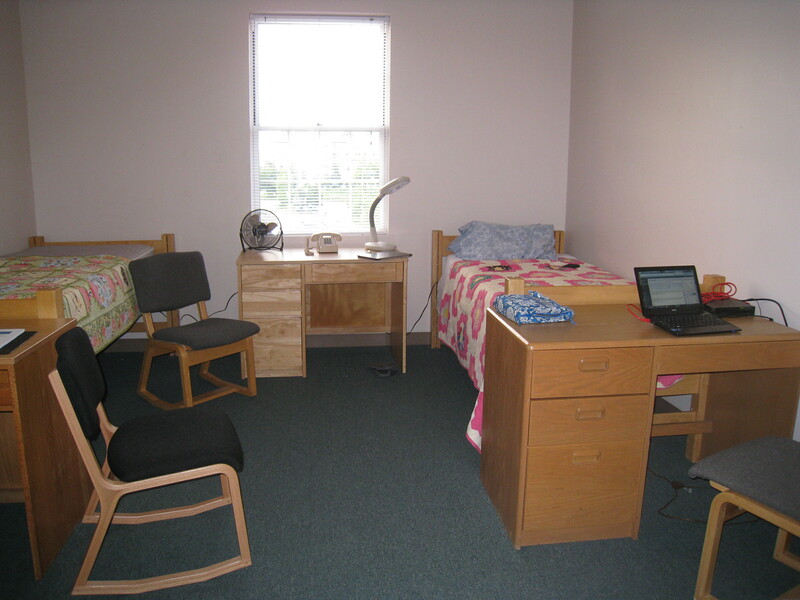 My dorm room was a large triple – I had the room (as well as microwave, mini frig, and bathroom) to myself. Since I was driving, I was able to bring a couple things. I was glad I brought the quilt, lamp and extra pillows from home. I arrived on Sunday and moved into the dorm. I knew several people who planned to attend, but that’s not a necessity – genealogists are friendly. Some people shared dorm rooms and even those staying at local motels were welcome to pay by the meal to eat conveniently in the cafeteria. The schedule on Sunday was to check in, get settled, and have dinner in the cafeteria. This was followed by a welcome session and some door prizes. I was in for a surprise at GRIP, though, because after the class lists came out, I heard from a young woman named Sara that she was my husband’s third cousin and would be there, and in the same class, and she was looking forward to meeting me. I had to look back at my email to remember that my husband and I had corresponded with Sara several years ago, and she was obviously an accomplished genealogist who had done some excellent work on my husband’s difficult family tree. I was very happy to be able to meet her. Our classroom early in the morning. Monday morning, my first class was at 8:15. 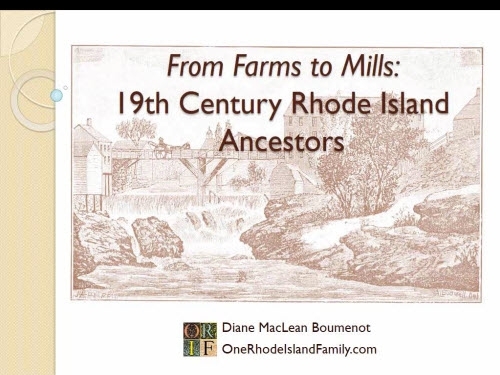 I enjoyed the talks and quickly realized this was a pretty intense learning experience – for people who truly want to learn more about methods and resources for family history research, these institutes are excellent. And I discovered there was homework each night. A takeaway from day one: get an old copy of Black’s law dictionary and look up each new term you encounter in probate, deeds, etc. A late 1800’s copy should be available for free download from Google Books. No point in buying a new one; the old terminology was removed a couple decades ago. 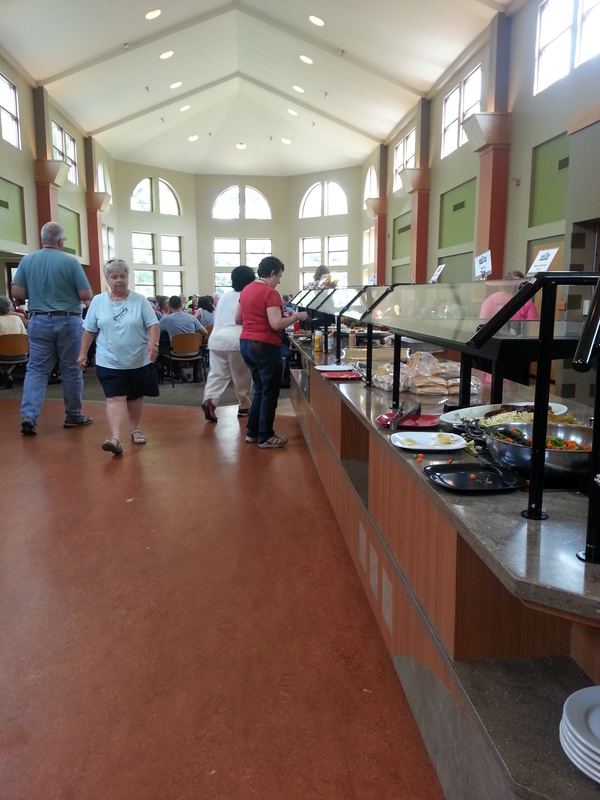 The lunch line, with the table area in the background. By Tuesday I was getting used to things. Judy Russell is a superb and experienced teacher; she is a clear speaker and very interesting. I was far less familiar with the material being covered by Rick Sayre, about federal laws and how to find documents related to the federal government, but the wheels were turning as he got me wondering about all sorts of records I’ve never looked for. Clearly, there are many research projects ahead for me. Tip for the day: Try this website: “A Century of Lawmaking” for index entries to government records that you may need to further track down and obtain. 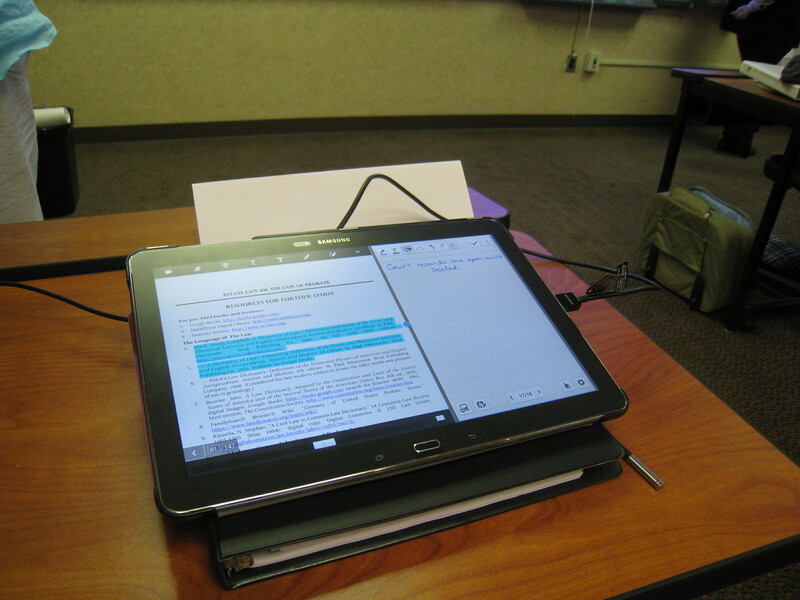 Using my Galaxy Note tablet, I could keep the screen open for writing notes (with the stylus), plus another window for the pdf app to look at the syllabus. My friend Linda McCauley showed me how to open the syllabus in Acrobat Reader so I could also highlight, write on it, etc. She’s brilliant! On Wednesday we were treated to two sessions with Marian L . Smith, who leads the Historic Research Branch at US Citizenship and Immigration Services (Department of Homeland Security). Marian has immense knowledge of immigration and naturalization records and she gave us excellent advice about what records might exist in what era, and about the laws (and purposes) behind the various questions, forms, and records. Since naturalization procedures were only moved to the federal government in the 1890’s, prior records – like the 1840’s records I am seeking – could be in any state, county or local court of record. As I listened to Marian I realized I could definitely obtain, at some point, my grandparents’ naturalization records from when they came from Nova Scotia in the early 1900’s. 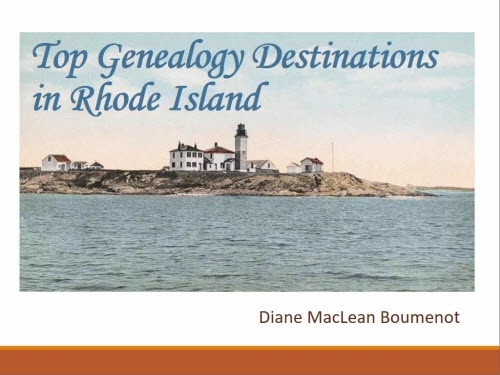 My takeaway from Wednesday was to pay the $20 for a Genealogy Program Index Search to obtain the correct record numbers for an ancestor processed after 1893 (but not ship manifest records, or records from port locations). Then I could pursue getting the actual records. That night I ate dinner with a friend from the DNA class and asked her about some questions I had about testing. That’s almost the best thing about being here – the mealtime conversations about genealogy. The season premiere of Who Do You Think You Are? was enjoyed by the crowd Wednesday night. There were many aspects of the show that related to knowledge of the law for the time and places mentioned. 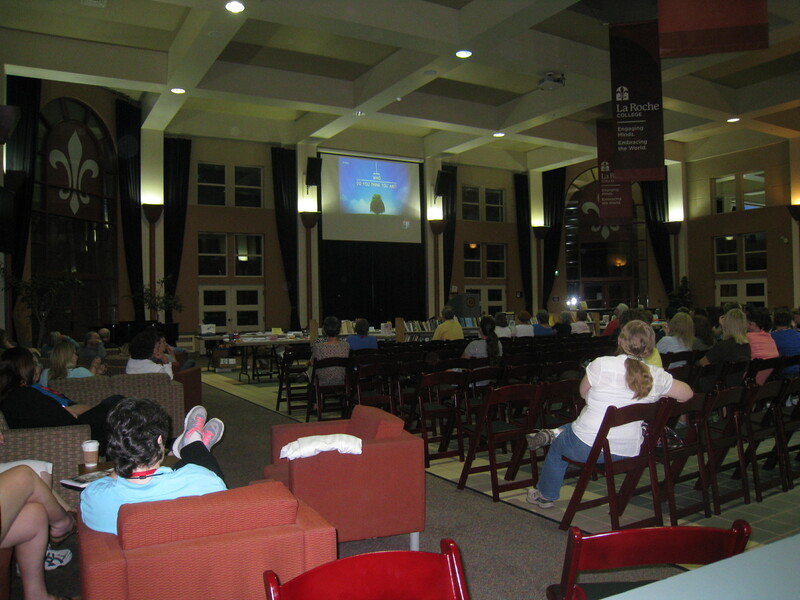 Some of the crowd enjoying the season opener of Who Do You Think You Are? On Thursday, the content was focused on laws about women, children, marriage and divorce. There were also sessions on military pensions and Claims Committees. I am on a mission to find supporting papers for my ggg-grandfather’s 1878 claim for reparations after the Civil War. I feel like I have some more things to try now. Takeaway from this day: when using those faulty OCR-produced index services on the internet (in other words, indexing NOT produced by humans) try to use as many services as possible (like maybe Ancestry.com, Fold3 and Family Search) since they will all have different index entries. My books from the Maia’s Books exhibit. She is willing to ship them, also. On Friday, I finalized my book purchases from Maia’s books, we had our last sessions, received certificates and prepared to depart. Our teachers sent us a set of electronic documents they had gathered just for us, which I look forward to exploring more at home. The major point of this week: find the law that will help you understand more about the document you’re reading, and also the reverse of that: continue to learn more about laws that might have impacted our ancestors, and produced record sets we’re not even thinking of. The whole process this week was one of reading the informative articles in the syllabus (over 100 pages), listening to and occasionally participating in the lectures, and following that up with homework each night, and, when I return home, with a lot of research I would like to do using my new knowledge and skills, plus the extra documents to go through. There were interesting talks each night for the whole group, and I heard wonderful things about each one, but didn’t attend them. I had some quiet evenings with friends or just doing homework. I can heartily endorse this program. The company was wonderful, the classes truly excellent, things ran smoothly and I know that’s not easy, and I am going home with a list a mile long of things I should be trying and ideas for specific problems. Nothing is perfect, and staying in a dorm is never a dream vacation, but overall I have no complaints. I have had more genealogy conversations here (along the lines of Did you try this? Did you look here? What about … ?) than probably any other venue I have ever been in. I am grateful to my teachers Judy Russell, Rick Sayre, and Marian Smith. I learned this week that there are laws (or occasionally some other motivation) behind records and we need to understand those purposes, look up national and local laws, and think through what was allowed and legal for the time and place that our ancestors lived. Knowing the law can give us data and genealogical information that never appears in any index. If person A did x in a certain year, and x could only be done by people of a certain age, that gives you a piece of data you may not find anywhere else. And legal records are absolutely filled with direct evidence too, for instance when certain facts had to be documented for, say, a pension application. Did our ancestors ever lie? Well sure, but that’s just part of the fun. You can see the 2015 program here. I had a great week and I look forward to similar events in the future. Enjoyed your post about our class. I wish I had met you while I was there. I tend not to introduce myself very well. Thank you Lisa. If/when I met people it tended to be in the chairs in the open area; I think the class did not leave me with a lot of energy for that either. But, another time I hope I do meet you. I was at GRIP in the Intermediate Genealogy course. Love your post! Next year, I’ll take more photos. I enjoyed seeing the cafeteria, classrooms, etc. I am missing it already! 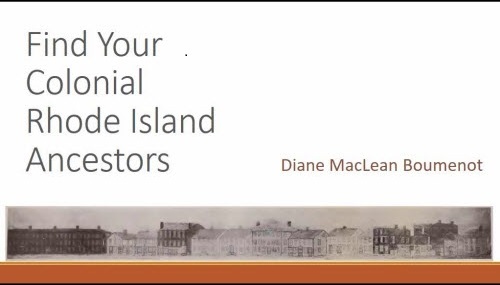 Diane, what is the genealogy program index search you mentioned, and how do you request it? Barbara I will leave a link here on Saturday. Good question!